Providing the best care possible means greater patient retention and recommendations, which leads to more business and more money. An easy way to improve work efficiency is by using two way radio walkie talkies to communicate more clearly and effectively. Two way radios can help you monitor the facility, clean up messes quickly, delegate tasks to patients who need help, and offer the best care available. Two way radios with or without earpieces lead to improved communication, security, and response time. With a simple one button push-to-talk system, you can train your employees quickly and accomplish more in every work day. 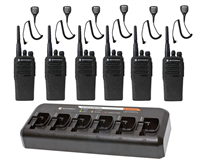 Whether you're a small business or a large facility, we have the right two way radio for you. The Motorola RMU2040 is great for smaller rehab facilities as it will communicate up to 250,000 square feet in most situations. The RMU2040 has great audio quality, battery life, and has anti-microbial coating. For most rehab centers, the Motorola RDU4100 is a fantastic choice. The RDU4100 will communicate up to 350,000 square feet and 30 floors, has a battery life up to 18.5 hours, and is extremely durable. The Motorola DTR550 offers digital communication and will get similar range to the Motorola RDU4100. The DTR550 will have crisp and clear audio quality since it is digital and also allows for one-to-one communication.